The serene beauty of the Peace Plant is a heartfelt expression of your deepest sympathy. 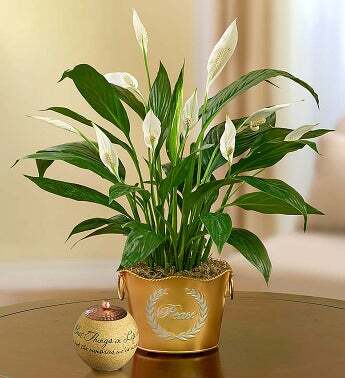 Featuring lush green leaves and graceful white blooms, it’s placed in a striking gold planter with the word “peace” embossed on it. Let this gift offer comfort and support to those mourning the loss of a loved one.